Welcome back to our July 2008 issue #002 of Bangkok Travelbug. Bangkok Travelbug, the newsletter of Tour Bangkok Legacies, covers people, places and events of historical and cultural significance in Bangkok to give visitors a more enriching travel experience. Here’s what we have in store for you this month. If you enjoyed reading this e-zine, please forward it to a friend. If a friend forwarded this to you and if you found it interesting, please subscribe by clicking on this link, Bangkok Travelbug. July is a holy month in Thailand. The start of the Buddhist Lent is in July and this period lasts for three months. On 17 July 2008, the 15th day 8th lunar month (full moon), it’s Asarnha Bucha Day. Buddha delivered his first sermon after his enlightenment on Asarnha Bucha Day. The following day is the start of the Buddhist Lent, Khao Pansa. The Buddhist Lent is a period of austerity and abstinence. Monks retreat to the monasteries to meditate and study the scriptures. Traditionally Khao Pansa is also the start of the rainy season but this year rain came in early May. This is the result of Cyclone Nargis that hit Myanmar from the Andaman Sea. Thankfully Thailand was spared, blocked by mountain ranges which form a natural barrier along the entire Myanmar-Thai border. An important ceremony in July is the changing of robes for the Emerald Buddha for the rainy season. This ceremony is performed three times a year; in March for the hot season, July for the rainy season and November for the cool season. This ceremony used to be performed by HM King Bhumipol Adulyadej but in recent years, HRH Crown Prince Maha Vajiralongkorn performs the rites. The Buddhist Lent will last for exactly 90 days or three lunar months till 14 October 2007 which is the 15th day of the 11th lunar month. We would like to thank you for your interesting newsletters and information about Thailand. We have been to Thailand three times now, and really enjoyed the newsletter about Thailand's history. More tourists (and locals) should get to know the country's past. Holidays are not just about getting a good tan or visiting the markets, massage parlors etc. There is so much else to see and do in Thailand. The Thai people are wonderful, friendly, helpful and spontaneous. Keep up the good work & hope to meet with you in due course. Thank you very much, Ron and Jackie, for your compliments and support. Please enjoy the rest of your visits to Thailand as much, if not more, than your first three. It was a rainy Sunday afternoon in June, when I decided to go down to the Central Chitlom department store to view an exhibition of the works of Galileo Chini. Chini was an Italian artist from Florence who was commissioned by King Rama V in 1910 to paint the murals on the domed ceiling of the Ananda Samakhom Throne Hall. The masterpieces by Chini, who arrived in Thailand in 1911, are now a national treasure and an art legacy. However, the exhibition also revealed the painstaking preparations and studies Chini undertook to familiarize himself with the country he has never visited before. He toured old Siam learning and photographing scenes in the country, the architecture, culture and customs, dress and the way of life. As his job required murals of the first six kings of the Chakri dynasty, he studied the character and major contribution of each reign, the royal regalia and ceremonies. The exhibits show Chini initiation to life in old Siam, his preparations for the murals in the throne hall, scenes of old Siam with oils, water colors and sketches. Chini’s artistic talents weren’t limited to painting or drawing. He delved into Oriental ceramics as well, painting the designs before transferring them onto ceramics. His crowning glory was the use of his artistry in opera. Turandot, an opera based on a Chinese princess in the Forbidden City of Imperial China, was Giacomo Puccini’s last masterpiece. Chini created the sets for Turandot, although he’s never been to China. The opera was first performed in Milan in 1926, two years after Puccini’s death. In September 1998, Turandot opened in Beijing under the baton of maestro Zubin Mehta. The complete set of Galileo Chini’s photos, sketches, oils and ceramics were donated by Chini’s grand-daughter Paola Polidori Chini to the National Archives of Thailand in 2002. Chini’s family has also presented selected oil paintings to the Thai royal family. These exhibits were on display at the Central Chitlom department store near the Chitlom skytrain station during June. The event was jointly organized by the Italian Embassy, Chulalongkorn University and Central to commemorate 140 years of Italian Thai relations. For details of the Ananda Samakhon Throne Hall and Chini’s royal murals, please see Ananda Samakhom Throne Hall. In mid-May 2007, Accor Europe’s biggest hotelier, launched another hotel brand, MGallery. This new brand is positioned as a boutique hotel and 12 such hotels are planned for Thailand. The first in Bangkok is going to be in Siam Square and is scheduled to open by the end of 2008. Accor has several brands to cater for different market segments; the 5 star Sofitel, 5 star Pullman, 4 star Novotel, 4 star Mercure and the budget Ibis brands. 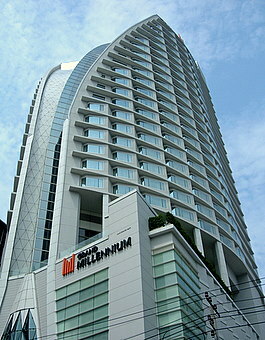 In October 2007, Accor launched their flagship Pullman King Power Bangkok Hotel in the King Power Complex, the downtown duty free shopping mall in Rangnam Road just north of Pratunam. Novotel King Power Bangkok, the other Accor hotel is adjacent to the complex as well. For those who want to do duty free shopping in the heart of Bangkok, this is the ideal place to shop and stay. The Grand Millennium Sukhumvit had its official opening in May, adding more 5 star luxury to the Asoke junction, Sukhumvit Road. The new hotel has 325 rooms and 2,000 sq m of banquet and convention halls. Citadines, a hotel brand of the Ascott group, is launching a new apartment hotel in Sukhumvit Soi 8. When I passed the site in early June, workmen were putting the finishing touches to the block. Review cheap Bangkok hotels and tell us about the great bargain and value for money deal you have discovered with your favorite Bangkok budget hotel. Click here to share your review of cheap Bangkok hotels with others! Our historical focus this month to acquaint visitors with the history of the places they are passing through is on Sukhumvit Road. Sukhumvit Road is a popular area for visitors to Bangkok for the hotels, bars and restaurants, street vendors, shops and malls and condominiums. Few of these visitors would have noticed the brown information boards put up by the Bangkok Tourist Bureau about the origins of this road. The road was built in the early 1950s when the United States had a growing presence in South-east Asia in the global Cold War. Besides military aid, money went into building highways and roads. Sukhumvit Road is one of the four highways radiating from Bangkok to the four corners of Thailand. The strategy then was to make the remote areas more accessible to combat the Communist insurgency. These highways gave access to the US air bases in the rural provinces where air raids were launched against Vietnam in the 1960s and 70s. From these highways, more metalled roads branched out to remote villages which were dominated by guerrillas. The other three highways are Phahon Yothin, Mitraphap, Phet Kasem. The opening of roads and the introduction of the Japanese motor cycle from the 1960s soon improved mobility in rural Thailand. As an indication of how vital these roads are today. In early June, angry rice farmers, fed up with low prices offered by rice millers, threatened to block all four highways leading to Bangkok unless the government intervened. This brought an immediate response from the government who pledged to buy the rice at a minimum price of 14,000 baht per tonne or US$424. As at 4 June, the export price is US$921 or 30,400 baht per tonne. The farmers were originally offered US$333 – US$363 or 11,000 - 12,000 baht per tonne. Old Bangkok hands reminisce over the Sukhumvit of old; dusty street, cracked sidewalks, rundown buildings and the rustic air of a provincial town. Sukhumvit Road today is a far cry from those early days. The area boasts the highest concentration of hotels in Bangkok and entertainment spots. For more of this, please see hotels in Sukhumvit. We’d love to hear comments, ideas and feedback from you. Please tell us what you think. Contact us at this link, E-mail-us. To return to Tour Bangkok Legacies Home Page.